In this French table etiquette article, we’ll talk about passing food around politely, refusing or accepting seconds, as well as the good manners for eating bread and cheese. The hostess will usually bring the dish to the table, , then offer the serving spoon to the woman guest of honor, saying “je vous en prie” (please go ahead). The later will help herself, then pass it to a man next to her. He shall not help himself, but offer it to the next woman of honor (rank or age…) who will then do the same as the first woman did. The hostess will help herself last of the women. Then pass the dish to the men. In less formal setting, the hostess might say something like “faisons les choses simplement, servez-vous et faisons tourner le plat, ce sera plus pratique” (let’s do things simply. Help yourself then let’s have the dish go around the table, it will be easier). Then each guest man or woman will help himself when the dish is being offered to him/her. 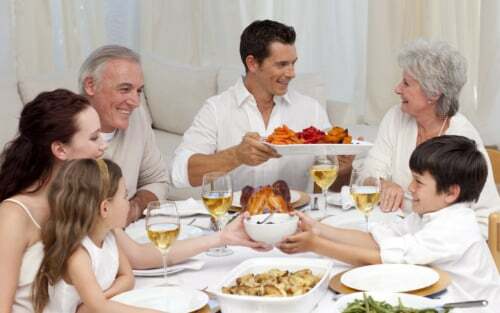 For a family dinner, especially if the main course is a large dish, the hostess might serve everybody. The plates of the women will be brought to her first, then those of the men. If he is very polite, a man should never help himself before the hostess does. So when his turn, he would offer her the dish and say “après vous, je vous en prie” (you first, please). You shouldn’t help yourself to the piece you prefer unless prompted to do so. Just pick the one in front of you. To offer seconds, the hostess will say: “resservez-vous, je vous en prie” – please have seconds. If you are no longer hungry, say: “c’est délicieux mais non merci” (it’s delicious but no thanks). We offer once, maybe twice, certainly not three times, which would be seen as being pushy. So, don’t hesitate to say “oui, avec plaisir” (yes, with pleasure) the first time around. Bread is essential to the French, who eat a lot of it, with each meal, each course – except desert when bread is put away. It is served in slices in a basket. Help yourself, then put the bread directly on the tablecloth, close to your plate – not on your plate. If you are in a formal place, bread plates might be used. When someone asks if “est-ce que je peux avoir un peu de pain” (may I have a bit of bread? ), you should pass the whole basket, not just a piece of bread. piece with your knife, then put it on the bite size of bread you have torn, and then put the bread in your mouth. Do not spread cheese or paté on a big piece of bread; it’s impolite to take a bite from a whole piece of bread, unless it’s breakfast and you are eating “une tartine” (kind of a toast, but it could be not toasted baguette for example). Never place the bread face down on the table an old superstition, symbol of death, the baker kept the one loaf of bread for the village executioner in that position. You should use your silverware if you need to push some food around in your plate, not a piece of bread. In a French meal, it’s likely that cheese will be offered. Usually not only one, but a carefully planned selection which we call “un plateau de fromage”. The proper way to cut a French cheese is almost an art form, and I wrote a whole article about how to cut the cheese in France (no pun intended…). As far as good manners and cheese are concerned, you need to know cheese is usually only offered once. You are supposed to help yourself to only two different cheese unless you are invited to try more. 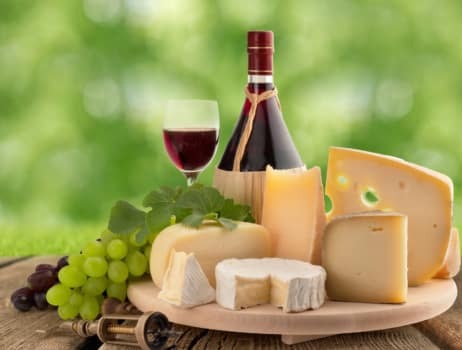 Cheese is a delicacy: eating too much may give the impression that the main course was not filling enough. Eating cheese properly in France is not easy: you should use your knife and bread only, and never touch the cheese with your hands. No fork either. Once the portion of cheese is in your plate, cut a smaller piece with your knife, place it (still with the knife) on a small piece of bread you have just torn away from your bread slice, and balance the cheese on the bread till it reaches your mouth. The hostess may have provided several serving knives for each cheese, but it’s rather unlikely. Most people only use one serving knife. After you are done serving yourself, gently scrape the serving knife against the side of your plate or a small piece of bread to remove any cheese left on it: you wouldn’t want the next person cutting a mild goat cheese with a knife full of Roquefort! Please, taste your food before you use any salt or pepper! If there is no salt nor pepper (le sel et le poivre) on the table at home, it might be a sign that the chef is confident that his seasoning is perfect… Depending on the formality of the place, and the talent of the chef, it might be seen as a faux pas to ask for some. Still, the polite way to ask is: “pouvez-vous me passer le sel / le poivre s’il vous plaît” (please pass the salt / pepper). I’ve heard people say that both salt and pepper should be passed together… I am not aware of this custom personally, but it makes sense. “après vous, je vous en prie” (you first, please). “pouvez-vous me passer le sel / le poivre s’il vous plaît” (please pass the salt / pepper).